This article is my reflection on the Universal Design (Chapter 10) by Dix et al. It introduces the reader to the concept of ‘Universal Design’ which is ‘Designing a system which can be used by anyone under any circumstance’. For designing such a universal system, the author describes 7 principles quoted by a group of researches at North Carolina State University, USA. These principles provide guidelines for the designers to incorporate in a system as many use cases as possible. In the later part, the author explains how a system can be made more universal by designing it for multiple senses using multi-model interaction principles. I believe designing products aiming only for the majority of the population is a design flaw. 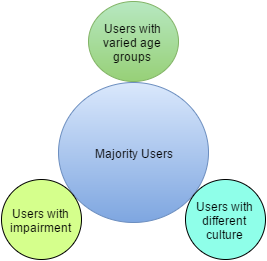 If a blind or a deaf individual cannot use the product with the same easy and flexibility as that of a non-disabled person, the design is not catering to the needs of all its users and thus these people are left with no other option but to take assistance. The author with his 7 design principles and the concept of multi-modal interaction proposes a solution to designing products that can be universally used. I liked the idea of incorporating various communicating mediums in the system viz. voice, touch, handwriting and gesture to exploit the redundancy and eventually make the service available to all kinds of users. A blind person can interact with the system using the voice recognition software whereas an old aged individual can use the gesture recognition techniques for navigating through the different web pages. Designing for multiple medium not only opens the gates to the special groups to use the system but also imbibes a sense of self-confidence in them in using today’s modern products. Going forward, I would definitely incorporate the principles of universal design in my work so as to allow special groups to use the system with ease and comfort.